MICHIGAN: Resource Recycling Systems (RRS) has announced the addition of Susan Graff as a new Principal and Vice President of Global Corporate Sustainability. Susan will join Anne Johnson to contribute to the growth of Global Corporate Sustainability practice. The huge investment made by RRS in this sector shows its commitment to this growing field that is estimated to be worth at least $300 million in 2013. Susan brings 15 years of experience in sustainability research and development (R&D) and management consulting to RRS as the former President of Atlanta based ERS Global. Graff has an established reputation as trusted advisor to a diverse range of Fortune 1000 executives, including Caterpillar, Interface and Mandarin Oriental Hotel Group. She led R&D of the Sustainability Scorecard to assist these companies manage risks and opportunities through new sustainable products and services for their clients. Prior to founding ERS Global, Susan had a 13 year career with US Environmental Protection Agency (EPA) that including both policy and technical leadership positions. She spearheaded establishment of science-based risk assessment methods at the Agency and served as chief of site assessment for the waste management division. As part of Susan’s portfolio of work, she will bring proven approaches such as the Sustainability Scorecard and Reporting Solution that RRS will deploy for the benefit of its customers. These solutions provide the foundation for a new systematic approach that RRS will offer their clients to accelerate their sustainability objectives. From her home base in Washington, DC, Susan will work with RRS on establishing this new area of practice. The service offerings will include a full range of corporate sustainability strategies that address the environmental, economic and energy challenges of RRS’s clients. 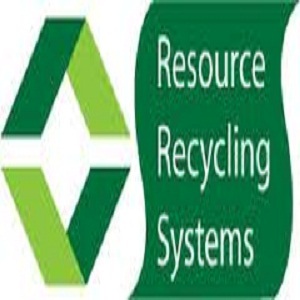 Resource Recycling Systems (RRS) is a consulting firm dedicated to building real waste free solutions for our clients, their businesses and communities.